We express our solidarity with the Vinhedo Unilever workers’ strike, which began this Friday, September 29, against the productive restructuring of the company that entails the dismissal of 130 employees. 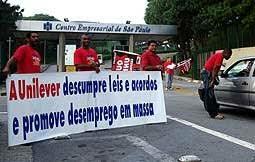 Unemployment in Brazil reaches more than 13 million workers. The cost of living has increased but not workers’ salaries. In the midst of this, Unilever announced a "productive restructuring" that would automate some sectors and outsource another whole one. It is important to say that the company’s net profit increased by 23.8% (3.11 billion euros) in the first and second quarters. We know that this is already a reflection of the recently approved Labor Reform and the Outsourcing Act. We also know that many workers will still be affected, this is only the beginning of the attacks, so more than ever solidarity among us is necessary. Given this scenario, we stand in solidarity with the striking workers and demand the end of the outsourcing in the company as well as the preservation of all workers’ jobs.